This is the West Rose window above the front entrance. According to information from the church, Charles Connick designed the Great Rose Window at the top in 1933. It depicts Christ in Glory, surrounded by angels, beatitudes, the four evangelists (Matthew, Mark, Luke, John), the prophets (Isaiah, Jeremiah, Daniel, and Ezekiel), Divine Love, Seraphim, and Divine Wisdom: Cherubim. The Lower Rose window is also by Connick in 1933. "The seven points of the star are derived from the Revelation of St. John. In the center is Our Lords Monogram, IHS, the first three letters of Jesus in Greek, surrounded by seven fountains, seven vines, seven pairs of doves and seven stars." Charles Connick (1875–1945) was a prominent artist best known for his work in stained glass in the Gothic Revival style. He was born in Crawford Country, Pennsylvania and developed an interest in drawing at an early age. He left high school when his father became disabled to become an illustrator on the staff of the Pittsburgh Press. At the age of 19, he learned the art of stained glass as an apprentice in the shop of Rudy Brothers in Pittsburgh, where he stayed through 1899. He worked for a number of stained glass companies in Pittsburgh and New York. He went to England and France to study ancient and modern stained glass, including those in the Chartres Cathedral. His first major work was First Baptist Church in Pittsburgh in 1912. Connick settled in Boston opening a stained glass studio in Back Bay in 1913; the Charles J. Connick Associates Studio continued to operate after his death until 1986. 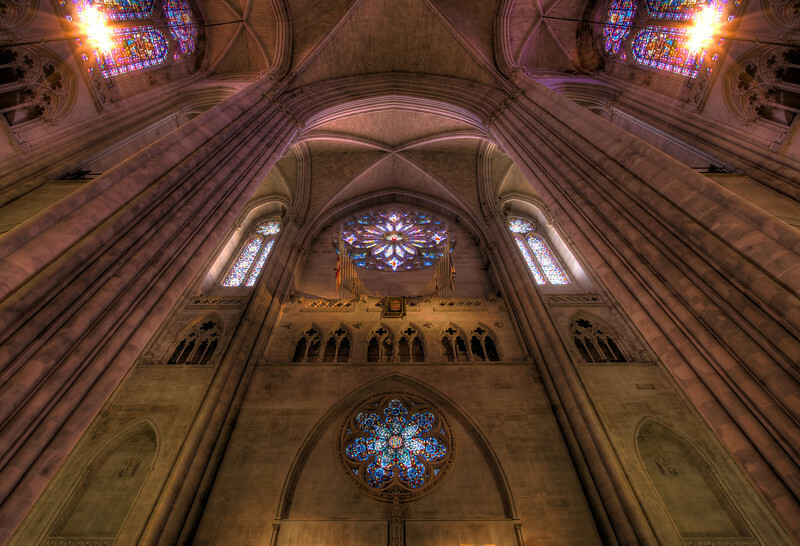 He produced many notable windows in such churches as Saint Patrick’s Cathedral, Saint John the Divine, the Princeton University Chapel, and Saint Vincent Ferrer. According to Wikipedia, the Charles J. Connick Associates Studio produced some 15,000 windows in more than 5,000 churches and public buildings. Here is an interesting video from the Massachusetts Institute of Technology on Connick. In December 2008, the foundation donated materials to the MIT’s Rotch Library of Architecture and Planning to form the Charles J. Connick Stained Glass Foundation Collection. This shot is captured with a focal length of 16mm. This is an HDR combining three exposures (-2, 0, 2) ranging in duration from 2 seconds to 30 seconds at f8, 100 ISO.